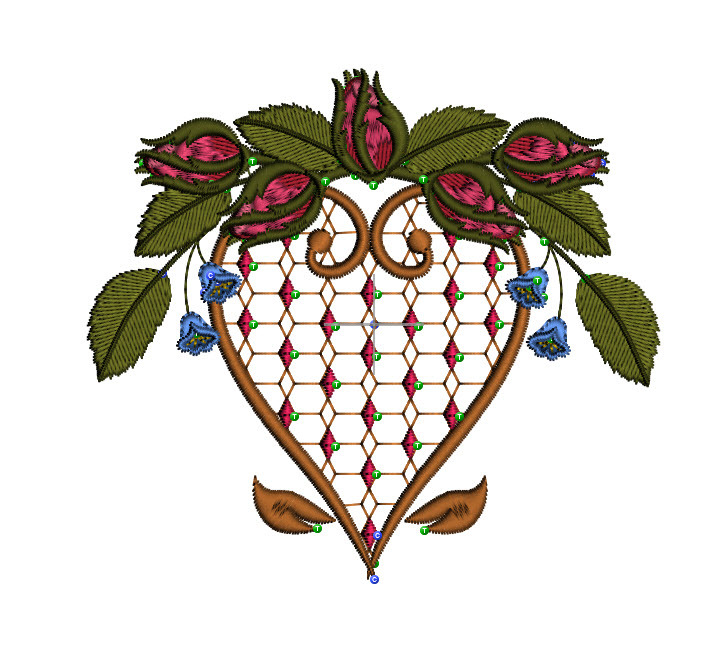 The new collection I am currently working on has life like roses, mostly in bud, ribbons, hearts and scrolls. I have called it Floribunda’s Serenade especially as the open roses look so much like that type of rose. I have created unique designs with the potential for some amazing projects. 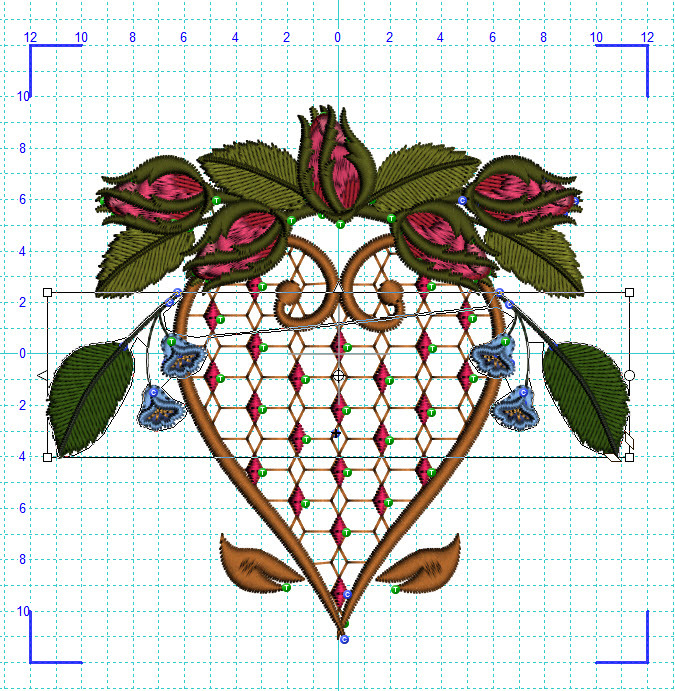 As we approach Valentines Day I thought it would be good to share how I would combine the heart in the collection with more rose buds and little bell flowers, using my Embroidery software, Husqvarna 5D Professional. Open GFE-FSB-freebie and GFE-FSB-1-14 in your software (I used the Stitch Editor plus module in my software so this is what you will see in the images). 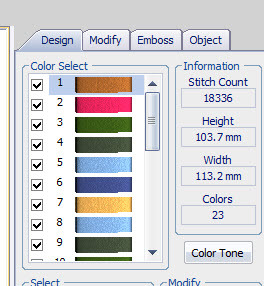 You do not need the designs with Outline alignment stitches. (OAS) Select a hoop size of 120mm by 120mm for GFE-FSB-1-14 which is the design you are adapting. 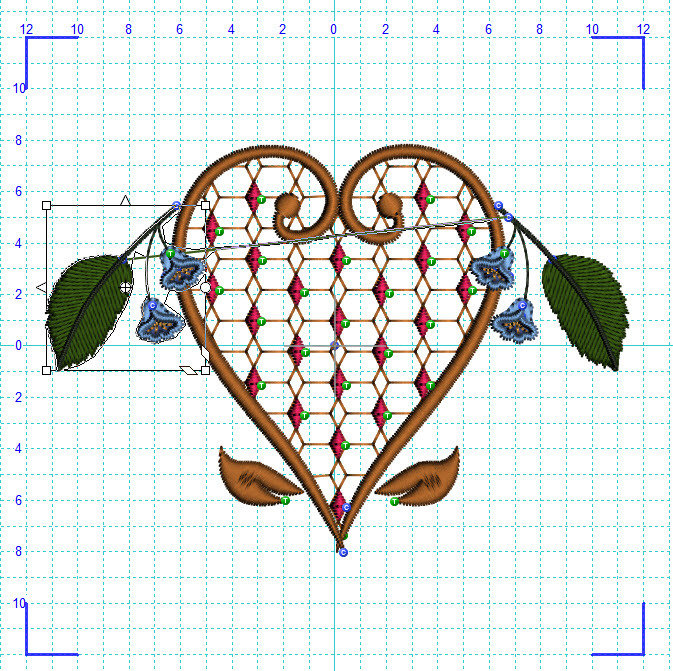 Copy and paste the GFE-FSB-freebie onto GFE-FSB-1-14 placing the top bell over the edge of the heart using the gird lines as guides. Not to worry about the density as I have tested it for you. Remember exactly where you placed the design on the grid. Copy and paste it again, click to flip it horizontally (in my software that involves clicking on the circle in the middle of the left side of the box that surrounds the newly pasted design) and place it opposite the first design on the same gird lines. At this point I suggest that you colour sort the design to reduce the colour changes. 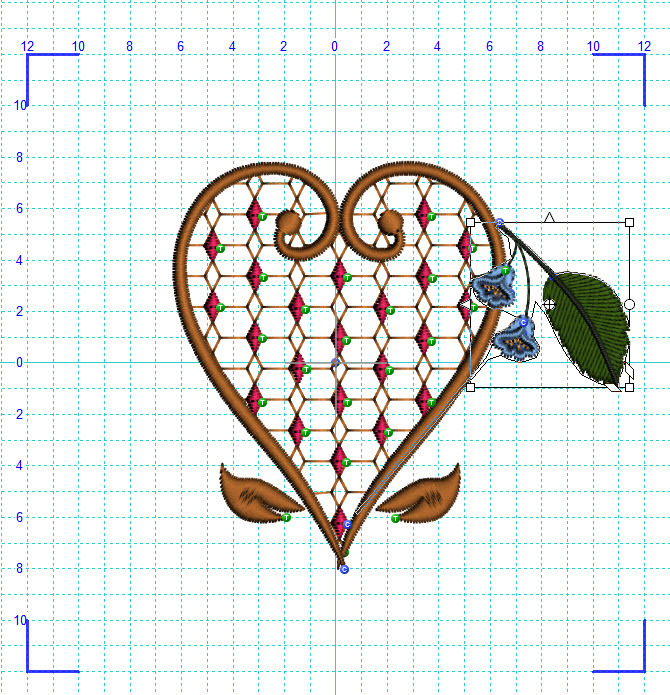 Move the whole heart along with the freebie to the lower section of the hoop area. In yet another window open GFE-FSB-1-24. 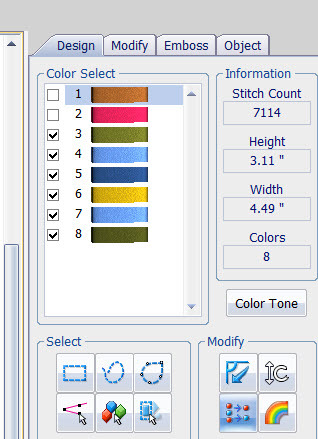 Select the first five colours in GFE-FSB-1-24 as shown in the diagram to the left. 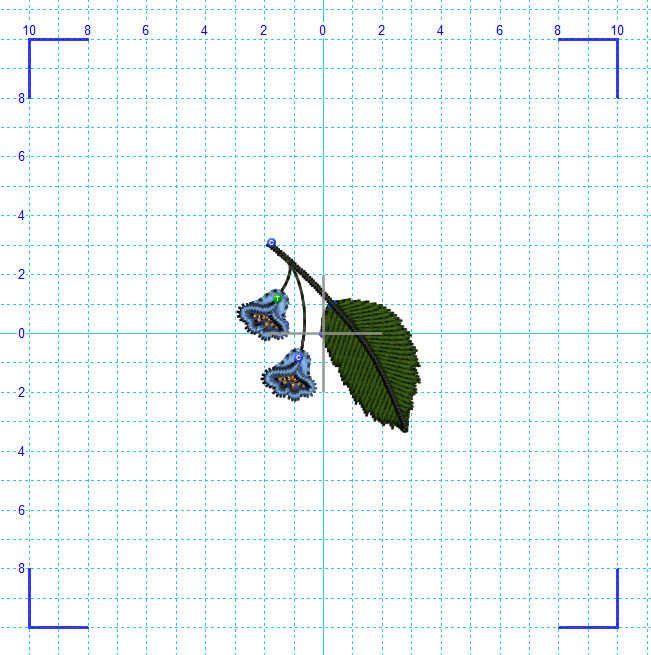 You will then only have the small blue bell flowers and their stems selected along with some larger stems for the roses. 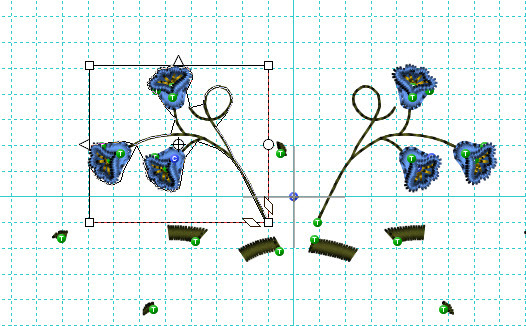 With your selections tools (I prefer the lasso tool) draw around the left side bell flowers and their stems. When they are selected you may delete them. 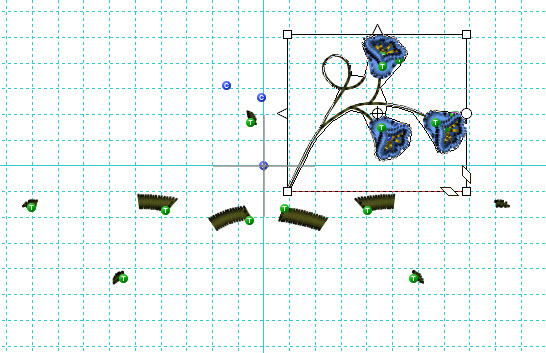 Now select the other stem & flowers to delete them too. 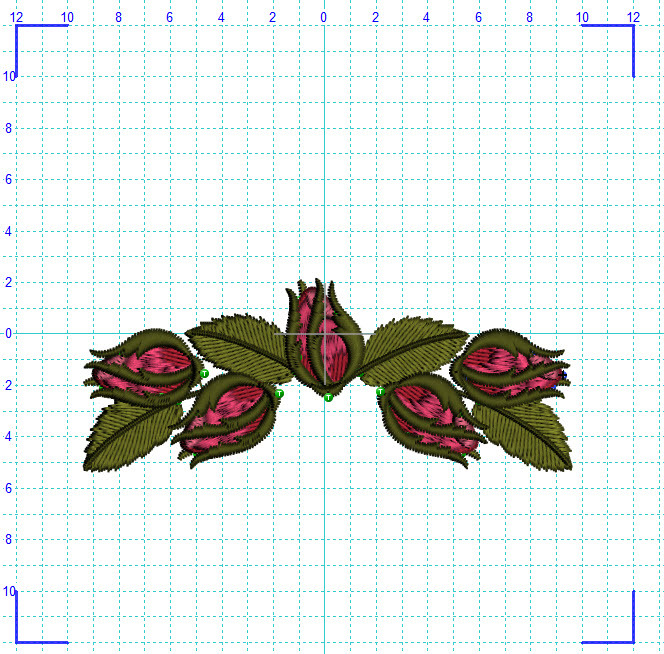 Make sure that the thorns and larger stems in the lower section remain in your design. 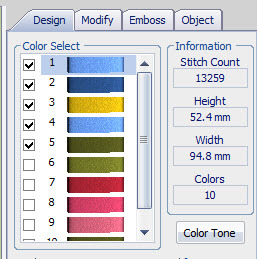 Re-select the remaining colours which have been hidden. Your design will now look like this and have 5 colours left. 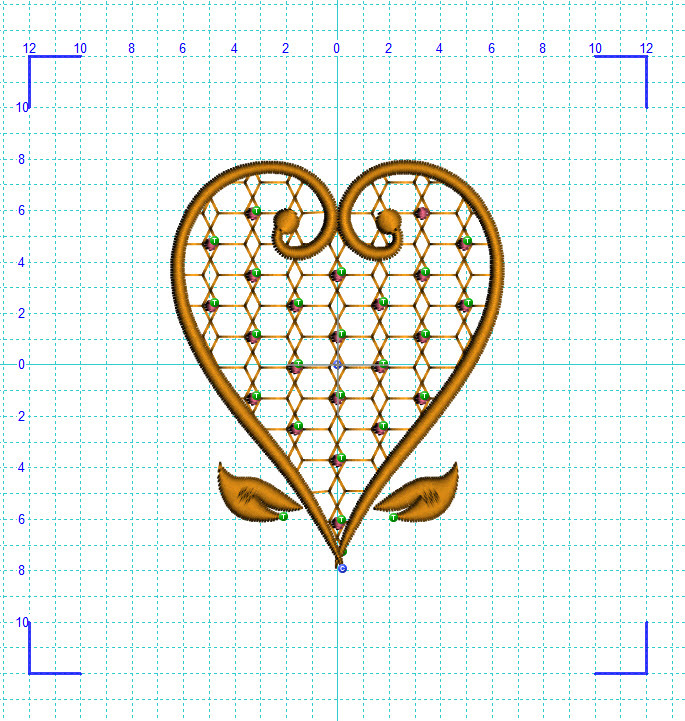 Select the whole design and copy it on to the heart being sure to place it centrally. Note the handles each side and the small arrow in the centre of the box that surrounds the design. Make sure the arrow is on the centre gird marked “O”. 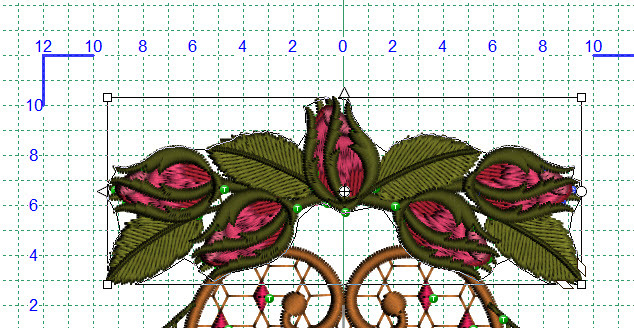 At this point you may need to select the colours of the freebies (colours 3-8) to move them up underneath the rose buds as the 2 freebie sections are too low. There are several ways to do this. 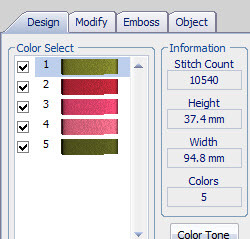 In my software there is a little box on the left of each colour and if you deselect a colour it will not be visible on the working area. When you have only the leaves and bell flowers showing, select them. Check that the selection is sitting centrally by making sure the arrow is sitting on the “O” grid. Then restore all the colours, keeping your selection, so you can carefully move the selection up fit under the roses as shown below. Before you stitch out this design it is best to sort the colour blocks so minimise the number of thread changes and centre the design in the hoop. You should end up with a design with similar dimensions. 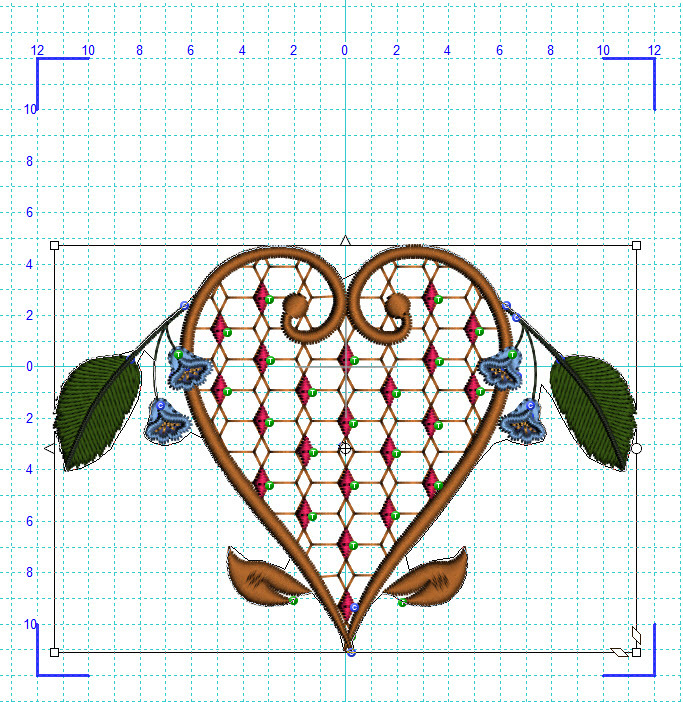 Here is your finished design which will be very suitable for a Valentines project like a special card for a loved one. 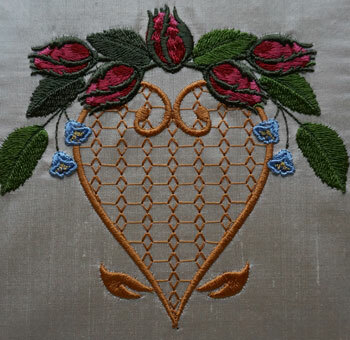 How about eliminating the embroidered details in the heart and adding crystals instead? To do this miss out the second colour block. 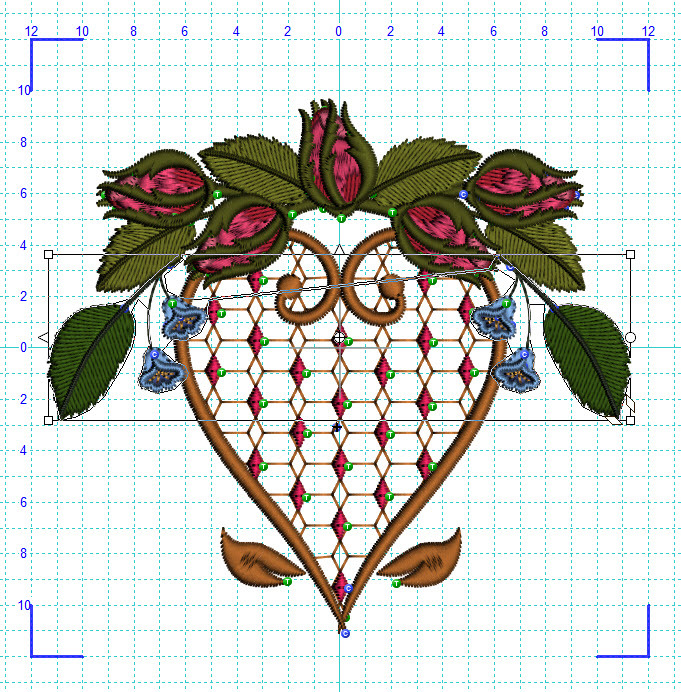 To pre-order the whole collection or just the first set of these lovely designs and download the freebie please visit and join the Graceful Embroidery group now. 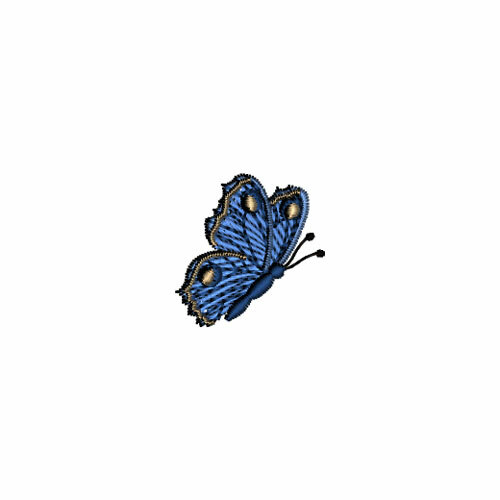 To just preview the collection and download the freebie visit my website. Love this and can’t wait to put this in a baby quilt I’m designing!